It's not that I'm a computer nerd, but old CD's just seem to pile up around our house. Here are some craft project ideas for recycling them, instead of throwing them out! Christmas florals, scraps from other projects, ribbon, etc. 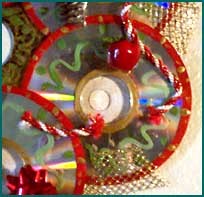 Use one of the CD's for the center of your wreath. Glue the other CD's around the edge, overlapping slightly. I used a combination of white glue and hot glue. If you prefer, you could use any circular form, made of wire or flat cardboard even. Paint a design on the CD's if you like. 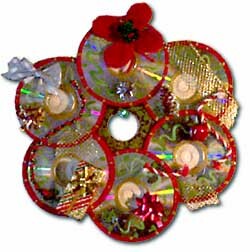 The large wreath here was painted with red around the outer rims of each CD, gold around the inner rims, and a squiggle of green in each center. The acrylic paint goes on rather thin, so I used two coats in some places. It might have worked better to use oil paint. Just about anything can be used to decorate your wreath. Use things that are colorful, sparkle, or just things that please your eye. All the things on this wreath were scrips and scraps from other projects - bits of ribbon, pine cones, coiled red chenille... I never throw anything away. This wreath is very simple to do. 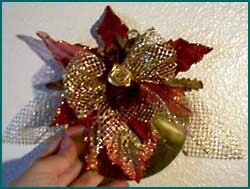 Take one gold CD and decorate to make a wreath you can hang on your tree or on a wall. I like to buy silk flowers and Christmas florals on sale and take them apart. This wreath is a combination of leaves and petals from several different silk fs. Use a wire cutter to take the flower apart and hot glue them in a pretty arrangement on the top of the CD. Make a small bow from ribbon and glue it to the center of your leaves/petals. If you like, glue some flower buds on top of the bow. Then attach a piece of ribbon to the back to hang.